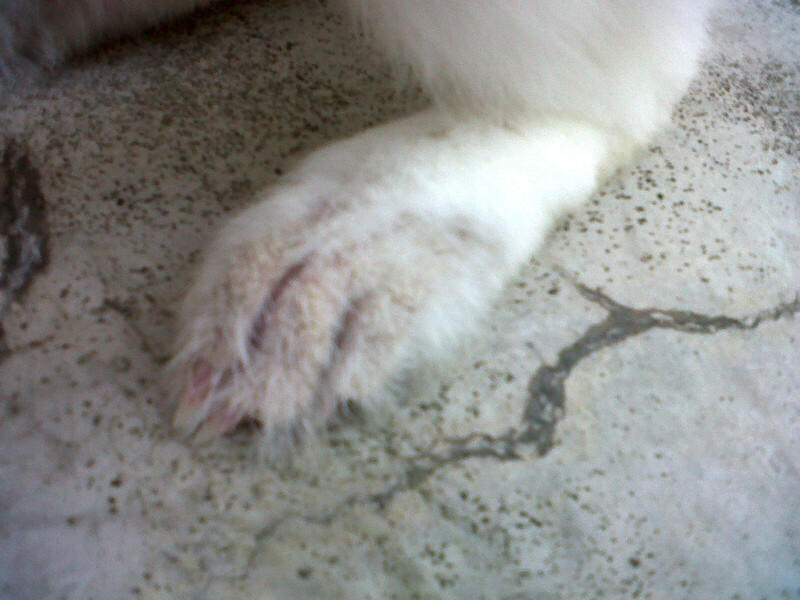 Paw Talk - Pet Forums > Other Pets > Rabbit Discussion > Dirty nose and fur loss on feet? 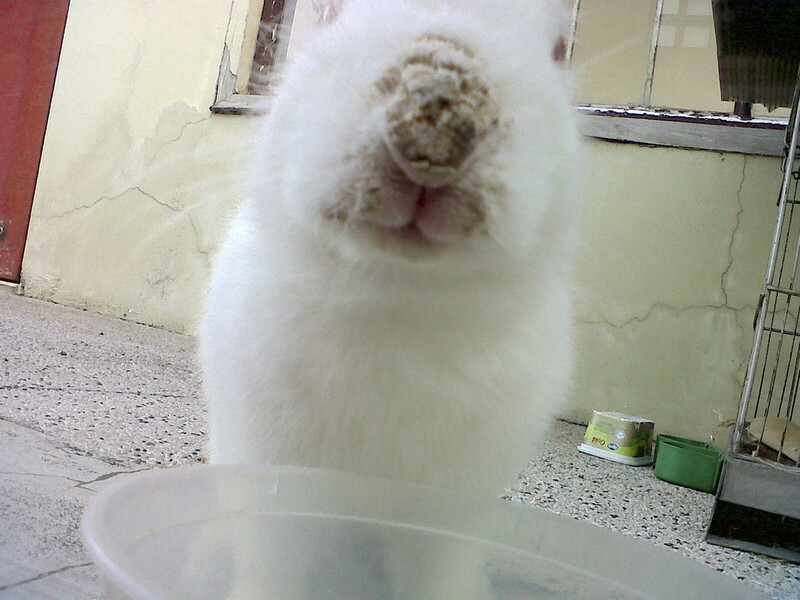 She was a house rabbit for a while then we decided to keep her outside instead, in our balcony. She has some shade there though she prefers staying out of her cage. We give her pellets and water everyday as well as some hay. She eats normally, though. Any help would be appreciated! Included some pictures. 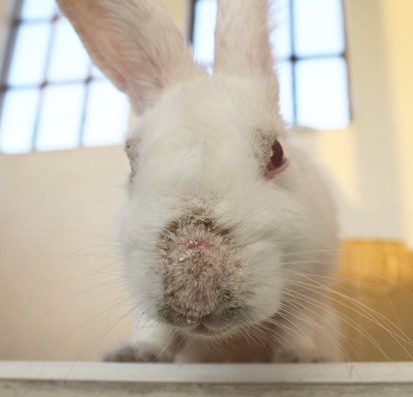 She's a cutie, but by the looks of her nose I'd guess that she may have rabbit syphilis. Sounds nasty I know, but it is very treatable and not transferable to humans. 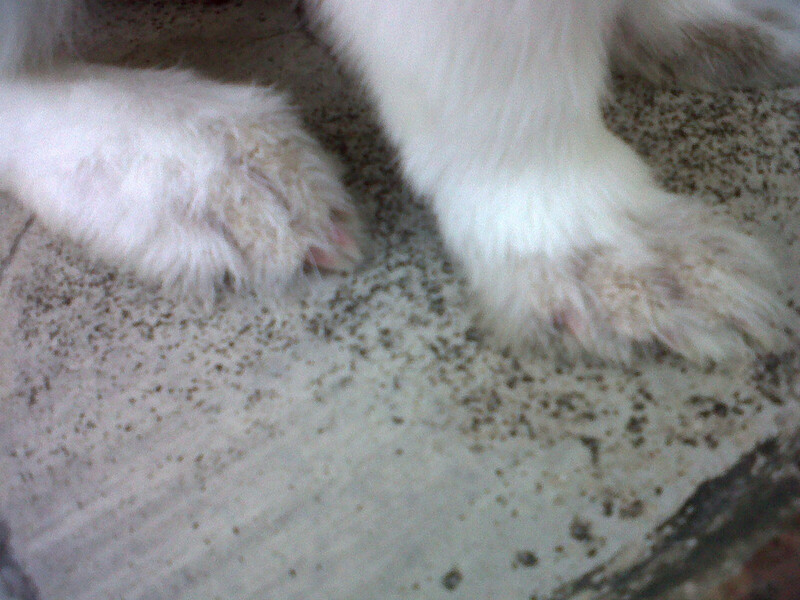 It's caused by a bacteria and treated with antibiotics. I'm not a vet so I could be wrong, but either way it's not normal for her nose and feet to look like that. I'd recommend you get her in for a vet visit. 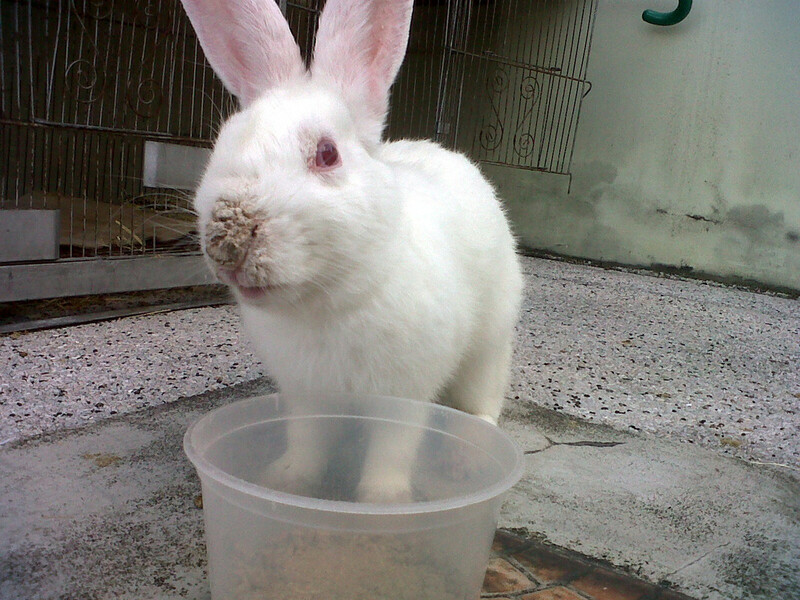 id definetly bring her to a vet, it can be many things, I recommend her being a house bunny though. Thanks to both of you! I will bring her to a vet soon. And I will try keeping her inside instead. Your kitty really looks so sweet and cute, hope those bacterias go away so we can fully see her total cuteness. 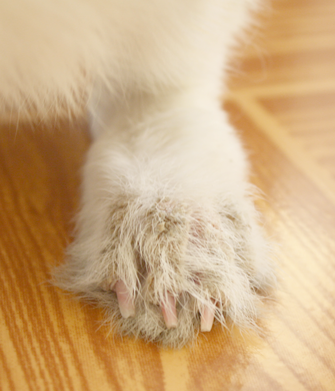 At the vet, they took off patches of hardened fur, or "crustiness" with forceps. It seemed painful as it drew (just a little) blood. Is it really okay to do this? They didn't take much from her feet. They treated the crusty parts (nose, tops of feet, edges of ears, eyelids) with an antiseptic (Betadine. I'm not sure if this is safe for rabbits either!) then gave me a cream I have to apply twice a day for a month or so until the mites go away. 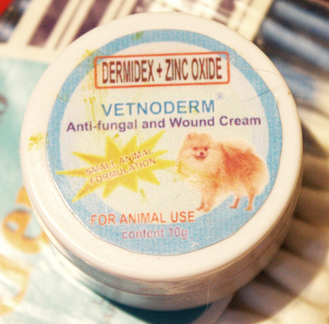 It's Dermidex + Zinc Oxide. It's called Vetnoderm. Anyone familiar with this? Last edited by streudel; 04-19-2012 at 10:56 AM. Aw what a cutie she is, even with the mites. Was the vet you took her too rabbit savvy? It's okay that they removed some of the crustiness. They maybe wanted to look at it under a microscope to get a better idea of what it was? 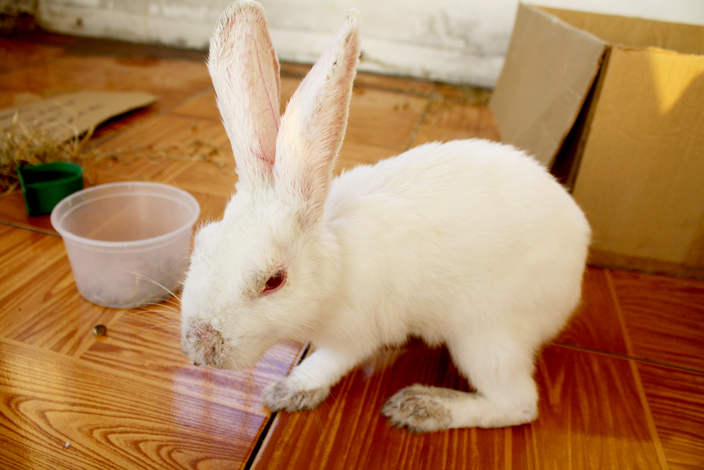 Betadine is safe to use on rabbits. I'm not familiar with Vetnoderm. It's kind of weird that the container says anti-fungal. Mites aren't a fungus. Vets around here commonly use Ivermectin to treat mites. Thank you! I'm not sure, I guess I'm gonna have to trust the vet, but certainly he didn't specialize in rabbits. I don't think they wanted to test the crustiness though..
Should I keep on removing the crustiness with tweezers? Will it help? It really is weird it's anti-fungal.. but will the Betadine work? Last edited by streudel; 04-19-2012 at 11:35 AM. How did they diagnose it as mites? Did they take a skin scraping and actually see mites under the microscope? 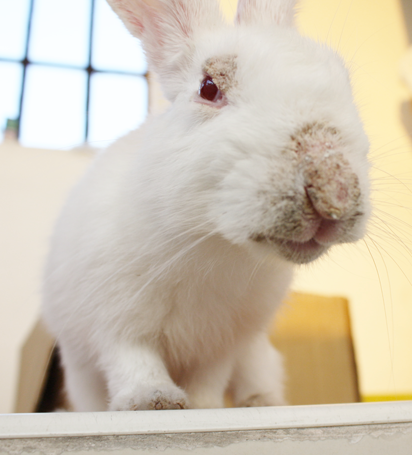 Have you tried to find a vet with more rabbit experience in your area? I'm not sure where you're located, but the House Rabbit Society has listings of rabbit experienced vets. Maybe one of them will be in your area? They did take skin scrapings (when they were removing all the crustiness) but they didn't test it or anything before coming up with the diagnosis. They said they've seen it in other rabbits. I live in the Philippines. I don't know, I will probably bring her to another vet if she doesn't get better, perhaps in the next two weeks? If they are sure that it's mites, maybe you could call and ask them about Ivermectin? That's what vets here usually use to treat mites. Here you can even get Ivermectin over the counter at farm supply type stores, but you'd want to talk to the vet about dosage and all that before giving it to your rabbit.